Everybody around the world now speaks about yoga which is the latest hype in the fitness industry. Some years back yoga was thought to be prevalent only among saints and old aged people. Now yoga has taken a deep-seated place in the heart of the young brigade too. Yoga not just keeps you fit but it also has a lot of long-term benefits when you make this an integral part of your lifestyle.The benefits of yoga are varied. The body requires and welcomes active movement. However, the physical benefits of various types of yoga, as reported by the millions of people who practice it, go much beyond that. They experience a better flexibility of the spine and joints, an increase in blood flow and oxygen, better posture and balance, toned and strengthened muscles, reduction of toxins built up in the body and good immune system response, etc. Practising basic yoga poses highly helpful for perfectly fit body and soul. Unlike other daily regimes, yoga also emphasises on the well being of mind and the soul with the help of meditation. If you wish to experiment it, then start off including, first the top 10 yoga poses for beginners in your daily routine, and feel the difference. This pose requires a considerable amount of flexibility. However, it does not mean that it cannot be included in the top 10 yoga poses for beginners, if you are flexible enough to do Paschimottanasana, you can add it to your routine. It cannot be performed with a full stomach so it would be ideally best to include it in your morning yoga routine as it requires stretching of your abdomen. It reduces fat deposition in the abdomen. It reduces anxiety, anger and irritability. A regular practice cures impotence and enhances the sexual power. It tones the abdominal-pelvic organs. Vajrasana is one of the most basic yoga poses that can be practiced even by beginners as it is a simple ‘sitting asana.’ This helps in easy digestion and strengthens the back and leg muscles and also improves posture. It is also good a warm-up exercise that will be helpful to perform more complex types of yoga poses. Improved digestion and relieves constipation. It strengthens lower back muscles. Helps to calm the mind and helps in relaxation. It tones the muscles of the hips, thighs and calf muscles. It improves blood flow throughout the body. This is a meditative type of yoga pose, so it is best if you practice it in the morning. That doesn’t mean that you cannot meditate in the evening. But it’s a must that it should be performed on an empty stomach. If not there should be a minimum gap 4-6 hours after and more importantly bowels should be clean as well. 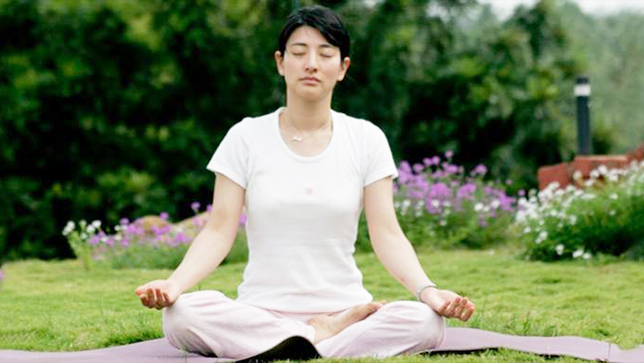 It helps in increased awareness and concentration and also calms the brain. This type of yoga must also be performed on an empty stomach or after 4-6 hours of an interval from food. This is also called the bow pose and requires stretching of abdomen, thorax, thighs, ankles, groin, throat, the front of the body, etc. This is a very basic yoga pose and there is nothing as complex as it looks. It strengthens the back muscles and it is beneficial in many ways. Check History of Yoga.. Helps to cure dyspepsia, rheumatism and gastrointestinal problems. It helps to resolve constipation. It improves the functioning of liver, pancreas, small intestine and large intestine. It strengthens ankles, thighs, groins, chest, and abdominal organs. Improve kidney and liver function. It cures respiratory disorder like asthma. When the pose is assumed, This resembles a wheel when posed. So it is also called the Chakrasana or the Wheel Pose, apart from also being called the Upward Facing Bow Pose.This asana is excellent for the flexibility of the spine. It enhances the oxygen flow to the lungs. This asana strengthens the back and also increases the elasticity of the spine. It helps to burn the fat in the abdomen area and tones the muscles; promotes better functioning of digestive and reproductive organs. It induces the endocrine glands and maintains the metabolism usually. It rectifies the menstrual problems in women. It stimulates the liver, spleen and kidneys. It purifies the blood and gives good peace and clarity of thoughts and removes the unwanted tiredness. Sarvangasana is one of the best among the top 10 yoga poses for beginners. This involves balancing the whole body on the shoulders. 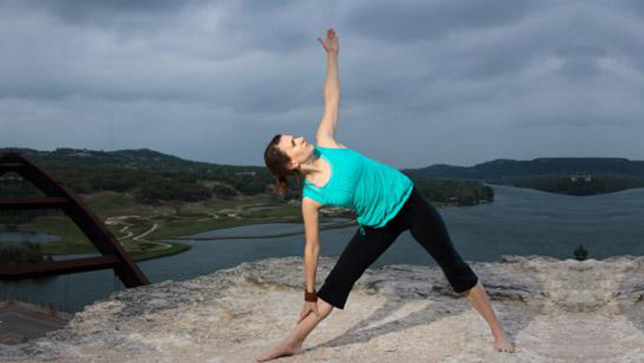 As the name suggests, this yoga pose influences the functioning of all parts of your body. 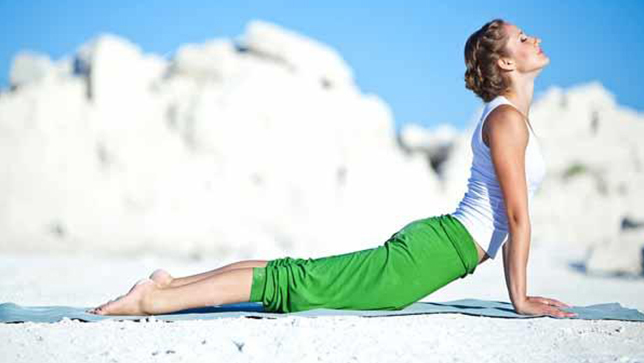 It is referred to as ‘Queen of asanas’ as it is highly beneficial for both mental and physical health. Good for thyroid disorder as it improves the blood flow to the thyroid gland. Sexual disorders are cured easily. It rectifies disorders in ears, nose and throat. Diseases at the bottom and around the heels are cured. Hair loss and premature graying of hair are put to an end or controlled. Halasana is little-advanced type yoga pose for beginners as it can cause a great deal of muscle trauma if it is not performed correctly. The term Halasana means ‘plow’ and ‘posture’ in Sanskrit. Halasana is often used to help treat reproductive problems, especially in women. Termed also the fish pose, if carried out in water, allows the body to float quite easily just like a fish; hence the name. Matsyasana is good for the thyroid gland which is located at the base of the neck and helps improving mood fluctuations. You can also read about basics things to know about yoga. This asana resembles a triangle and known to stretch the muscles and improve the regular bodily functions. Unlike most yoga postures, it requires keeping the eyes open to maintain body balance. Green Ayurveda strive towards achieving perfect health. The Yoga curriculum at Greens Ayurveda, includes the fundamentals of Yoga, Yoga philosophy, anatomy, physiology of Yoga, Different schools of Yoga, Asanas, Different meditation methods, Clinical yoga, and much more for the complete betterment. If you are interested in learning yoga courses in Kerala or you would like to know more details the yoga courses offered at Greens Ayurveda then just visit our website or contact us on +91 496 2504334!